Discipleship…read and then jump in! Disciples don't necessarily just have principles that they are willing to die for…they also have a list of practices that mark their lives. Disciples see each moment as one with an opportunity to be filled by Jesus – they sacramentalize each moment. Disciples receive with a thankful heart and know what it means to worship God by giving things away. Disciples are gripped by the things that are gripped by grace. Disciples live out the significance Jesus placed on the gathering/community of His people, what is called the Body of Christ, as being the hope of the world. Disicples know the difference between a "please, God" and "please God" prayer. Disicples approach living for the Kingdom of God not as obligation but as an adventure. Disciples know the difference between their effort, knowledge, experience, and energy and the potential that fills them when they are able to tap into the ultimate power-source, gift-releaser – the Holy Spirit. Disciples are not into volunteerism because they know that Jesus calls them into servant leadership and dedicated, humble service to God. Disciples understand the mystery of God and knowing that only by living the mystery will they understand what life is all about. Disicples know that having "eyes to see and ears to hear" has to do with being on the lookout for the movement of God in every moment of life. Disciples know that Jesus calls them to be the Church more than He does to go to church. Disciples know that God is not through with them yet and that their life would be best lived with a sign around their neck, "under construction". Disciples know that listening and loving is just as powerful, if not more powerful, than sharing their faith. Disciples realize that prayer has more to do with their transformation than it does with getting God to do something. Disciples know that when they are in the presence of one or more other disciples that the power of God is waiting in the wings. Disciples know that there is a difference between being hearers and doers of the Word. Disciples know that in the midst of every human contact there is the potential of a Divine appointment. Disciples live out the reality that discipleship for them means discipling others who will in turn disciple others who will in turn… In other words, Disciples understand that every person they come in contact with is "fair game" for discipling. Disciples love expressions of worship but understand that true worship is embodied in the phrase, "living sacrifice". Disciples know in their heart the cost of discipleship and that discipleship continues to cost. How about you? You have any additions? How about some phrases that YOU can add to the list? 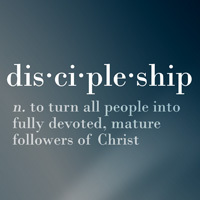 Post a comment and we'll continue to build on what it means for us to be Disciples/Followers of Jesus. loved this clever play on words and ideas. So true, in each context…but definitely defines what Discipling could and should look,sound and act like.